Subscribers can choose to receive a daily, weekly, or monthly email digest of news and features from the DigitalNC blog. 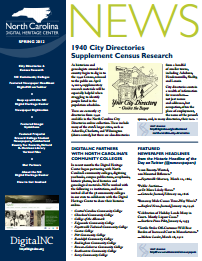 Our newsletter was published a few times each year, but is no longer produced. Please follow us on social media or subscribe above for the latest news!